With over 600 salmon reported caught, the River Moy saw another excellent week. Fresh fish were present throughout the system and were mostly in the 3 lbs. to 6 lbs. bracket. However, a number of bigger fish, well into double figures, were also caught. 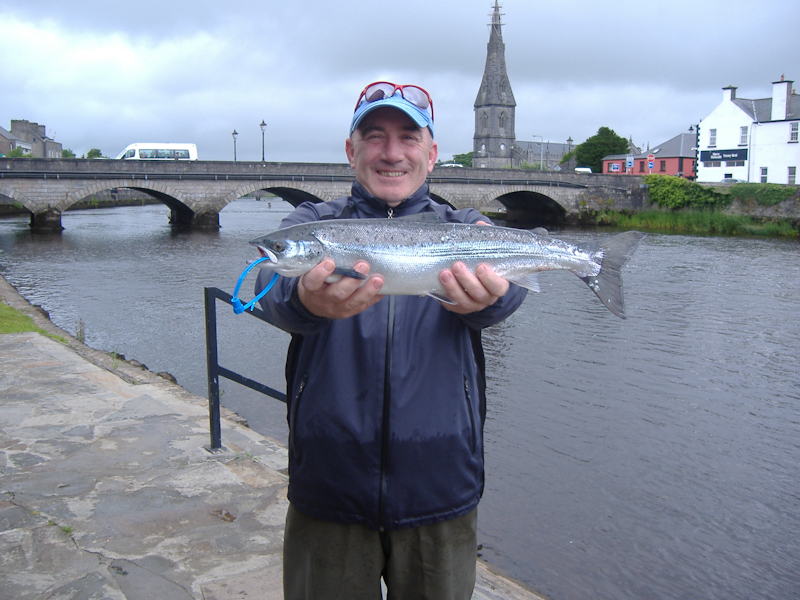 On the Ridge Pool, Paul Leonard, Limerick, caught his first ever salmon (3 lbs. on fly), while Javier Gomez, Spain, had two fish at 4.5 lbs. and 6 lbs. respectively also on fly. John McKinley, Athlone, scored on the Weir Pool with two grilse averaging 4.25 lbs. and Brian Fleming from Northern Ireland caught a nice 7.5 lbs. fish on the Cathedral Beat. 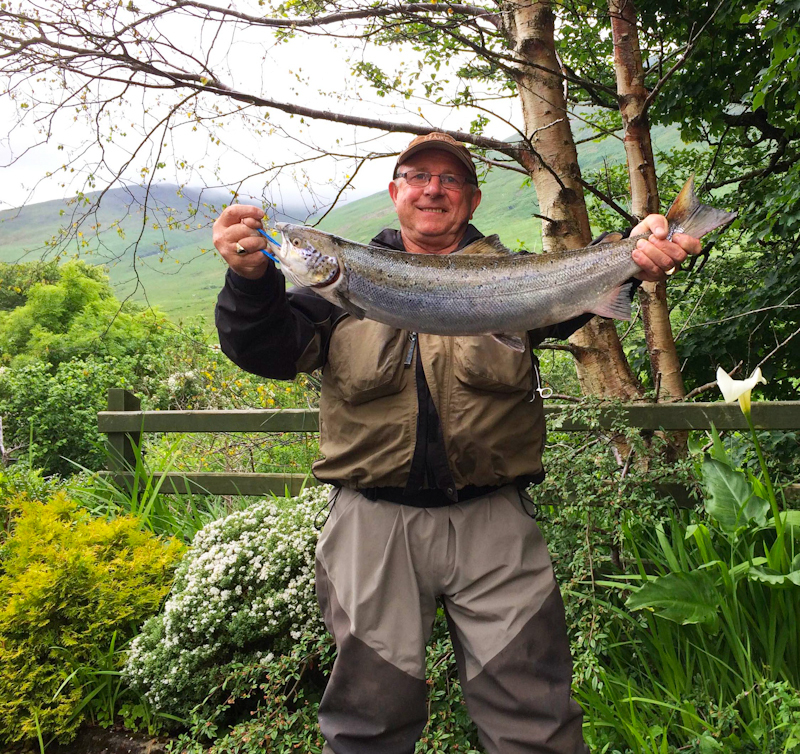 A proud Paul Leonard Limerick with his first ever salmon caught on the Ridge Pool. US angler, Allison Lepping had a fine 13.8 lbs. salmon on Mount Falcon, while Gilles Boudier enjoyed excellent fishing on Armstrong's with bubble & fly. The Frenchman landed 3 fish, best a cracking 16 lbs. salmon! Double figure fish were also caught by Jeff Wyles on Gannon's (10 lbs. on spinner) and Tom Carthew, Cork, on the Foxford Fishery (11.25 lbs. also on spinner). 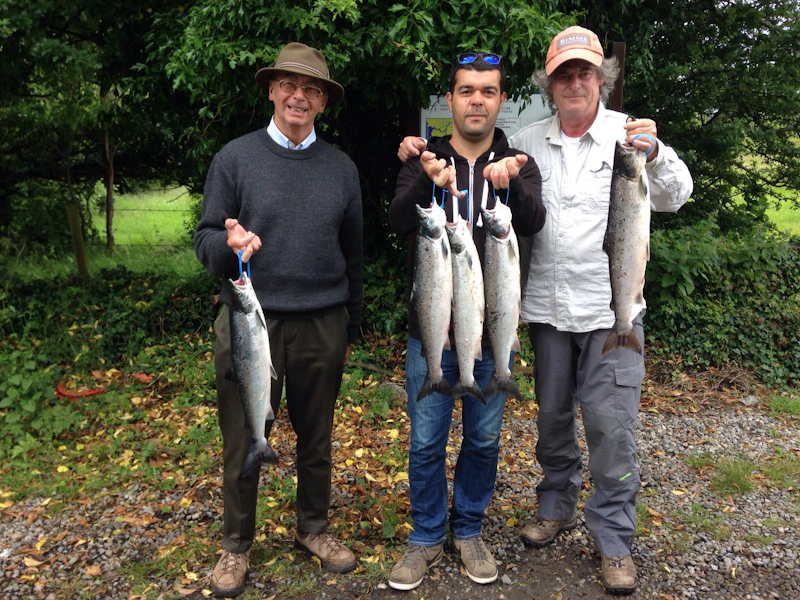 With over 100 fish reported, the Foxford Salmon Anglers' waters provided excellent sport for local and visiting anglers alike. Thierry Coulm also reported very good fishing during the week for a group of French angles on Cloongee. Amongst the successful anglers were Alain Bordessoule with 5 fish weighing between 4 lbs. and 7 lbs. and Freddy Turbin, who had 4 fish also between 4 lbs. and 7 lbs. Anglers on the East Mayo water also experienced fantastic fishing. Jo-Ann Rhodes from Foxford had a fine fourteen pounder on spinner, while Rubin Legros, France, caught 6 fish over two days, best at 9 lbs. also on spinner. Luke O'Connell reported that anglers on the Ballisodare Fishery enjoyed excellent fishing during the week. The fishery produced a fantastic 255 salmon (100 released) mainly between 4 lbs. and 5 lbs. with a good number of bigger fish also caught. Most fish were caught on fly or worm with only a few caught on the prawn at the Falls. On Monday June 20th, Liam Gilsenan had a lovely 9 lbs.+ bar of silver from the wall at Harrisson's on a small Green Highlander double. JB Chenaux and nephew Alex had good fishing for the week catching over 20 salmon all on the fly, most of which were released. On Wednesday June 22nd, juvenile angler Jack Hogan caught two nice fish on the worm at Harrisson's, one about 4.5 lbs. while the other was slightly bigger. Sticking on the juvenile angler topic, Darragh Kenny had the best fish of the week, a cracking eleven pounder taken on the fly at the Falls. Eamon Ruddy had a nice 6 lbs. fish on the worm also at Harrisson's, while Derek Woods managed a seven pounder at the Falls on the fly. On Thursday June 23rd,Noel and Kevin McKeever landed a good fish each at the Falls weighing 8 lbs. and 6 lbs. respectively. Vincent Henry had a good day up river catching 3 grilse, two of which were released, all around the 5 lbs. mark. On Friday June 24th, JJ Sullivan caught a nice fish of 8 lbs. at the Falls, while Mark Graham had a 6 lbs. fish upriver on the fly. 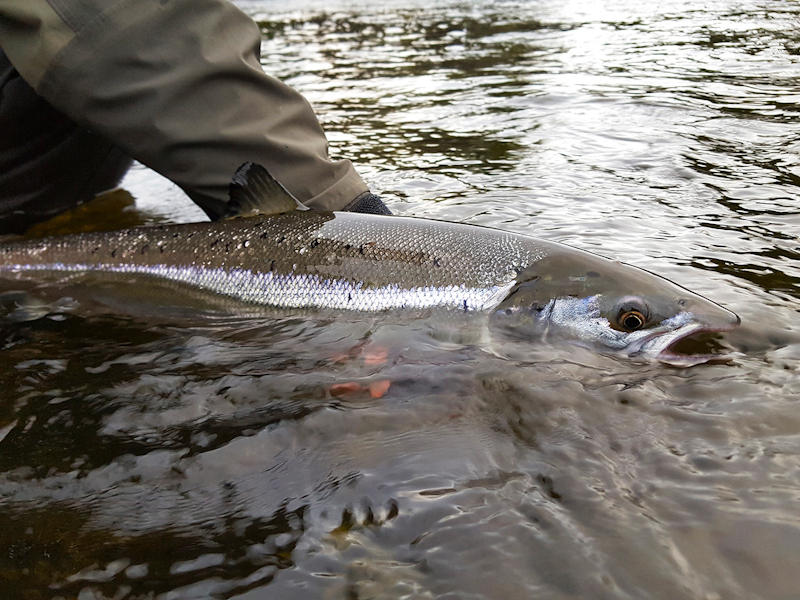 David Lee enjoyed a great weekend's fishing catching 4 grilse all on the fly, releasing 3 of them with one fish around the 7 lbs. mark. A group of visiting French anglers arrived on Saturday for a week and have started off their trip with 14 fish caught between 6 anglers over 2 days. Declan Gibbons reports on a week of good fishing for early risers again, despite tough conditions, as Caenis hatches continued, and reasonable fishing for wet fly anglers. 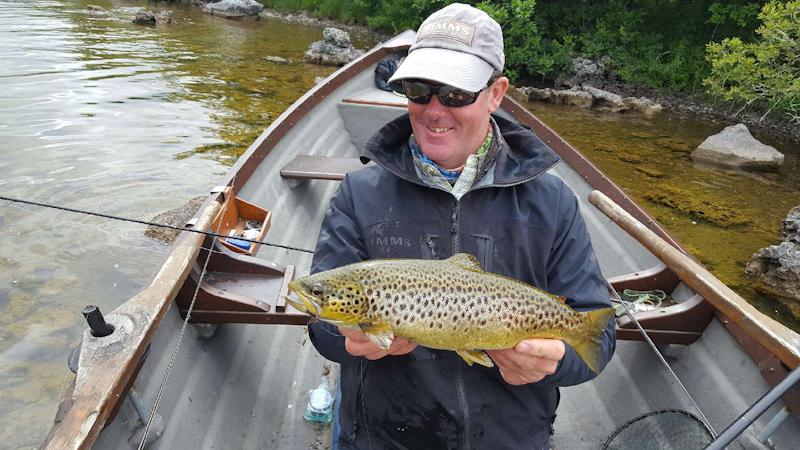 In the Cornamona area James McDonagh of Cashel, Connemara had an excellent trout of 4lbs caught dapping for his day on Lough Corrib. At Corrib View Lodge, Glencorrib (www.corribangling.com) the unsettled weather has made early morning fishing difficult but corribangling.com reported some good returns off Corrib over the last week. Gareth Jones from Wales caught and returned 19 trout over 4 days. Most fish were caught whilst being guided by Larry during early morning cCaenis sessions and 3 were taken on dry sedge on one evening. Malcom Patrick from England caught and returned 9 trout over 3 mornings on Caenis. Vaughn Ruckley from Scotland landed 10 trout over one early morning Caenis trip and and 2 on sedges day time fishing. The wind and temperature drop has slowed down Caenis hatches but sport is still to be had on dry sedges. Regular visitor from the UK Gareth Jones with a nice Corrib trout taken on a Caenis pattern, June 2016. On Sunday last Cairde Loch Coiribe hosted The Federation Cup (Catch & Release competition) out ofAnnaghdown. 56 Anglers participated , between them recording 40 trout caught, measured and released back into Lough Corrib. The competition was won by Ennis angler Seamus O'Loughlin with 5 trout for 4440 points, Castlerea angler Michael McDermott was in second place with 4 trout for 3620 points, and in third place was Kerry angler Kieran Casey who also had 4 trout for 3440 points. Longest fish on the day went to Michael McDermott of Castlerea with a fish of 51cms, while the team prize went to the Commercial Angling Club, just pipping home team Annaghdown. Corrib Gold - captured by Larry McCarthy but back swimming after a quick photo. In the Oughterard area Gerry Molloy (www.loughcorriboughterard.com) had an angling party of two Swiss and one German angler staying with him for two weeks - they caught 39 trout, 2 of which were 75cms, 164 perch, 7 pike up to 90cms and 9 grilse - all fish were returned with the exception of one grilse and one trout. Gerry himself fished for two hours on Sunday last dapping hoppers and had a fruitful couple of hours landing 3 trout with the best fish being 4 pounds. Basil Shields of Ardnasillagh Lodge Oughterard (086-0869758) reported a quiet week on the fishing front those that were fishing were rewarded. Visiting Scottish angler John Jacks and Dublin angler Larry Kelly had 7 fish for 2 days fishing, and visiting English angler Carol Neil had a trout of 2.5lbs for her visit to Oughterard. 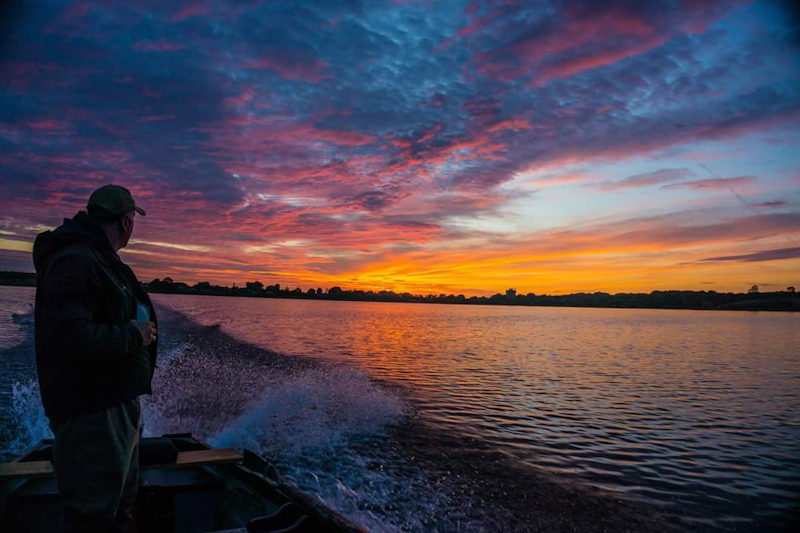 Early morning on Corrib as Larry McCarthy heads out on the lake. It was the best week of the season for the Galway Fishery, with 121 fish in the book, as well as many more lost. I hold my hand up here with 3 fish hooked and lost myself on Saturday evening! James Quinn reports the fishery averaged 17-18 fish per day, the best day being the 23rd with 23 fish, including 19 on fly, and 4 on shrimp. Thomas and Markus Ulbricht landed 3 between them to 5lbs, all on shrimp. Sean McManmon had a good day with fish released and kept for the plate. 97 years young Ned Cusack had 2 fish on shrimp of 3 and 5lbs. John Anderson had good sport with all his fish returned for the session as well as did Seamus Nee. International superstar banjo player Enda Scahill from We Banjo Three, who played for President Obama in the White House recently, caught a nice fish on fly. Seamus McEleney (Northern Ireland), Gernam angler Werner Meckle, and NI man Dessie McWhirter all landed 3 fish each, with 2 fish of 6lbs among them. Dublin man Dermot Quinlan landed 2 fish of 4.5 and 6.5lbs, and fellow Dub Shea Dolan had a 4.5lbs fish, all on shrimp. Dublin angler Tim Keane had a brace on fly of 3.5 and 4.5lbs. Louis Brennan from Tuam had 2 fish on shrimp to 5lbs, while Liam Gilsenan had a great morning catching his limit and releasing some fish. Limerick angler Eddie Corry had a good day as well, catching 3 and releasing 2 more fish. The famous Quinn brothers from Loughrea had a great evening with Kevin and Michael catching 6 fish and releasing 4 on fly, although rescuscitation attempts on one failed. As paramedics they are clearly not up to the job! 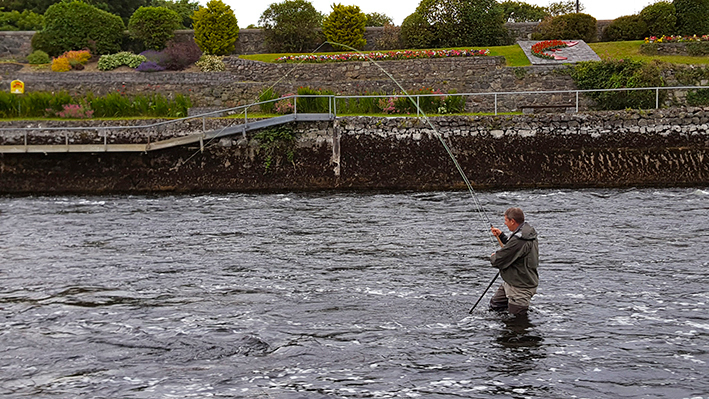 John Moloney playing a grilse on the Galway Fishery, June 2016. John Moloney releasing a nice fresh grilse on the Galway Fishery, June 2016. Fishery manager Terry Gallagher reports that following the recent flood, river levels were as good as could be hoped which was reflected in the rod catch. First up, Sean Kelly Jr ventured onto the middle river and was rewarded with a fresh 4lbs grilse. Brian Connaughton was delighted with his day on River Beat 1 after he landed 2 cracking fresh fish of 6lbs 12oz and 6lbs 8oz. 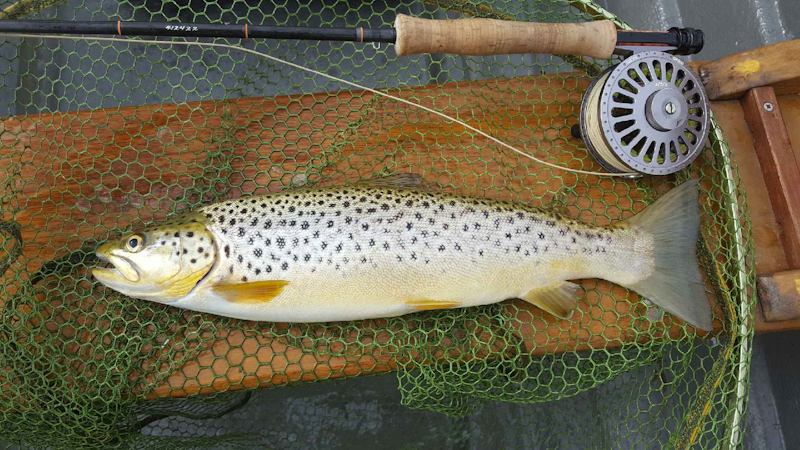 Neil Spellacy returned to Costello and struck gold when he caught grilse of 5lbs and 3lbs. Mattia Cestonaro fished with great determination and was rewarded with a 3lbs bar of silver. Sean Kelly Sr was delighted with his evening's fishing after he landed another silver bar of 3lbs 8oz. Finally, Brian Connaughton returned to Beat 1 and certainly was not disappointed to add a grilse of 5lbs to the 2 he caught the week before. At the time of writing, passing showers are keeping the water levels where we like to see them with salmon and sea trout still entering the system. Fishery manager Osgur Grieve says that water levels have improved on the Erriff, which has brought more fish into the river. "We have had 6 salmon for the period 23rd - 28th June. Walter Clayton, USA fished with us over a 3 day period and on his last day a Sunray Shadow produced a well-earned 4.5lbs grilse which he returned. Friday 24th saw 3 fish being caught on the evening shift. First off the mark was Erriff angling club secretary Conor O' Leary with a 3.25lbs grilse on a Cascade, then Paddy Donegan struck gold with a 9lbs salmon on a Willie Gunn, and Conor O'Leary was in again this time catching a 4.5lbs grilse on a Cascade which he returned. Both Paddy and Conor lost fish as well that evening. Alexander Mills who stayed with us caught a 4.25lbs grilse on a claret coloured shrimp fly on the morning of the 26th. Peter Robinson fished with us on the 27th and caught a nice grilse estimated at 3lbs which he sportingly returned. 3 sea trout were recorded this week in the 0.75-1lbs bracket. The recent rain has encouraged some more fish into the system which were showing at the falls yesterday. Well done to all our anglers and we look forward to the week ahead. John Fleming, skipper of the Brazen Hussy II is determined to make it a blue shark season to remember for his guests, and he kicked it off in style on Saturday with a fine blue of 84lbs to the boat for . John says they actually had a double hook-up at the same time, but the other shark threw the hook before they could get it to the boat. 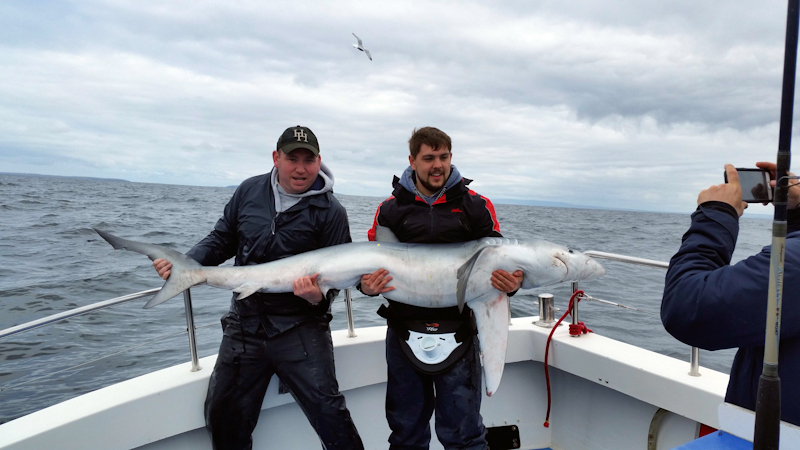 June is early for blues in Galway, so it's a good sign that water temperatures are up and it could be a good season for shark fishing. The first Galway Bay blue shark 0f 2016, caught aboard the Brazen Hussy II by skipper John Fleming and his crew for the day. The fish was estimated 84lbs using the length/girth measurement conversion.